Making the best carrot cake from scratch is so easy and fun! This two layer cake is made with pineapple, raisins, and walnuts for flavor and is decorated with homemade cream cheese icing. It’s a classic birthday cake or Easter dessert that the whole family will love! This recipe was originally published on April 4, 2018. For many years, carrot cake has been a family favorite dessert. Both of my younger sisters, Bookworm Beth and Artistic Alex, have enjoyed carrot cake for their first birthdays. For this blog post, I’ve adapted our family’s favorite recipe given to us by my grandmother many years ago. Hopefully this recipe will become a go to recipe in your family, too! Carrot cake is a spice cake made with grated carrots for sweetness and texture. (I also like to add crushed pineapple, raisins, and walnuts for additional flavor.) Carrot cake is usually a round, two-layer cake or rectangular sheet cake frosted with cream cheese icing. No one is 100% sure where carrot cake is from. It most likely is a descendant of the carrot puddings that were served in medieval Europe. The roots of modern carrot cake could be in England, France, or Switzerland. Americans have put their own twist on it with the cream cheese icing. Is carrot cake healthier than regular cake? Probably not. Just because it has vegetables in it doesn’t make it healthy! If you’re curious about the nutrition facts for this recipe, you can check them out at the end of the post. Why did my carrot cake sink in the middle? Underbaked. Next time, bake for a few minutes more; a toothpick inserted in the center should come out clean or with just a few moist crumbs attached. Many bakers are just 5 or 10 minutes away from perfection! The oven door was opened. Only open the oven door at the end of the baking time. Check the cakes by turning on the oven light. Too hot in the oven. Get an oven thermometer to calibrate your oven temperature. If it’s still too hot, try lowering the temperature by 25 F and baking longer. Too much leavening. Don’t be tempted to add extra baking soda or baking powder. Too much leavening will cause the cake to rise quickly, then collapse. Yes, you can–although I have never tried this substitution and cannot guarantee successful results with my recipe. If you’d like to try it, substitute equal parts unsweetened applesauce to oil (my recipe would take 1 1/2 cups or 366g of applesauce). Is your house 70 degrees or below? The cake should be fine at this temperature for 2-3 days. Carrot cake actually tastes great straight out of the fridge, so you can refrigerate it even if your house is cooler. Is your house above 70 degrees? I’d suggest putting it in the fridge, especially since the cake is iced with cream cheese icing. How do you store carrot cake? Put the cake in an airtight cake carrier or cut it in slices and seal them in an airtight container. Refrigerate if your house is 70 F or warmer; otherwise, you can store it at room temperature for 2-3 days. Yes, you can freeze carrot cake before or after you’ve iced it. Slice it and seal tightly in zip-top freezer bags, making sure to press out extra air. Freeze for up to 3 months, then defrost at room temperature. Whisk the dry ingredients in a large bowl until well blended. Toss the drained pineapple and raisins in 3 tablespoons of flour to prevent the fruit from sinking in the cake batter. Add the wet ingredients and fruit mixture to the dry ingredients and stir until well mixed. Pour into two 9-inch springform pans that have been buttered and lined with parchment paper. (I’d recommend using cake strips on the pans.) Bake at 350 F for 30-35 minutes, until a toothpick inserted in the center comes out clean or with a few moist crumbs attached. Let the cakes cool completely on wire cooling racks, then sandwich them together with homemade cream cheese icing. Decorate the top with grated carrot and chopped walnuts. This recipe is so moist and flavorful that it definitely deserves the title world’s greatest carrot cake recipe. Give it a try, and you’ll agree. Measure the ingredients accurately. Use a kitchen scale for best results. Finely grate the carrots for the best textured cake. Bring the eggs up to room temperature before making the cake. Forgot this step? Submerge cold eggs in fairly hot tap water for 10 minutes. Drain the pineapple thoroughly. Put the pineapple in a sieve and press out all the liquid with the back of a spoon. Why? Too much liquid will make the cake not turn out poorly. Toss the pineapple and raisins in 3 tablespoons of flour to keep the fruit from sinking in the cake batter. No one wants to find all the fruit at the bottom of the cake! Mix thoroughly, but not too much. Mix the ingredients until they’re well combined, then stop. Too much mixing, and you’ll have a tough cake; too little mixing, the cake will have an uneven texture and not much of a rise. Use cake strips for perfectly flat topped cakes. It makes decorating the cake so much easier! Let the cakes cool completely before icing them. Warm cakes will melt the icing, ruining the finish. Be sure the cream cheese and butter for the icing are softened before using. Looking for more spring desserts? You’ll want to try these ones. Easy Coconut Cream Pie: a creamy, dreamy combo of coconut pudding and sweetened whipped cream. 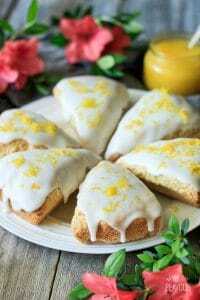 Easy Glazed Lemon Scones: a delightful lemony treat perfect for afternoon tea. Easy Lemon Bars: these shortbread-based bars will be hit with the lemon fans in your life. The pleasure of a 5-star review of this carrot cake recipe would be greatly appreciated. Preheat the oven to 350 F. Lightly butter the base and sides of two 9-inch springform pans, then line the bases with parchment paper. If you’d like to use cake strips, soak them in cold water for 15 minutes, squeeze out some of the excess water, and cinch them around the pans. Whisk 2 1/2 cups (300g) of all-purpose flour with the caster sugar, cinnamon, baking soda, baking powder, and salt in a large bowl. Set aside. Drain the pineapple thoroughly in a sieve, pressing out as much liquid as possible with the back of a spoon. You should have 1 packed cup (255g) of pineapple. Toss the drained pineapple and raisins with 3 tablespoons (22g) of all-purpose flour to help prevent the fruit from sinking in the cake batter. Grate the carrot and chop the walnuts. Add the grated carrot, olive oil, eggs, vanilla, pineapple, raisins, and chopped walnuts to the dry ingredients and mix with a spoon until well blended. Bake the cakes at 350 F for 30-35 minutes, until a toothpick inserted in the center of the cake comes out with a couple moist crumbs attached. The middle of the cake should just barely spring back when gently pressed with a fingertip. Remove the sides of the springform pans and let the cakes cool on a wire rack for 10 minutes. Take the cakes off the bases with a cake lifter and let them cool completely on the racks before icing, about 1 1/2 hours. Beat the softened cream cheese and butter in the bowl of a stand mixer until fluffy, then gradually sift in the icing sugar and beat until well combined. Mix in the vanilla extract and enough heavy whipping cream to make the icing a spreadable consistency. Add a little extra icing sugar if needed for flavor and texture. Flip the cakes upside down onto plastic wrap and gently peel off the parchment from the base. The plastic wrap helps the cake not to stick. Place one of the cakes on the serving plate and spread half of the icing on top. Carefully place the other cake on top to make a sandwich, then decoratively spread on the remaining icing. Decorate the top with extra grated carrot and chopped walnuts. Serve at room temperature or chilled. If you’re not using the cream cheese icing right away, press a piece of plastic wrap onto the surface of the icing to prevent a skin from forming. Leftover carrot cake keeps very well in the fridge for a few days if it’s stored in a plastic cake carrier. For long term storage, keep the cake in the freezer.